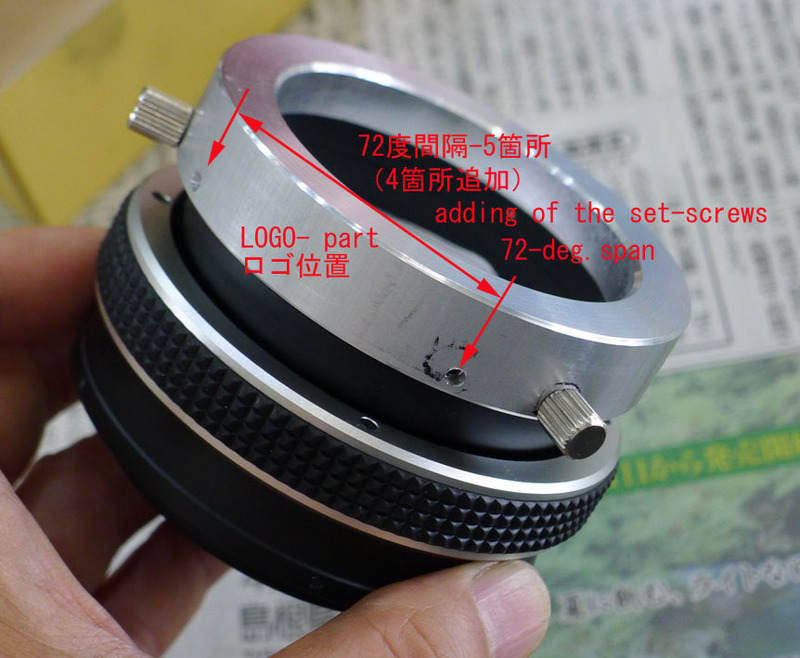 As I mentioned in the report dated 6/26, I added the set-screws of the larger Helicoid from 3 to 7. As the Helicoid was additionally processed from the original 3 of 120-deg. span, two of the 7 set-screws are dummy. The next lot of the larger Helicoid will have 5 set-screws with 72-deg. span. Judging from the terrestrial viewing the unique oiled three- elements objectives seem to be superb. But, my concern is other aspects of the OTA. This OTA was also rather top heavy and I could not shift the OTA forward enough I wished to do. It’s not fault of only this OTA, but I can say about all of the high graded three elements Apochromatic OTA. But I wonder why the concerning guys who claims that they are interested in my EMS-BINO would not make effort of solving the COV(Center Of Gravity) issue. Anyway I made my best in shifting the OTA forward as far as possible. I found the knobs of the focusers would collide with the pillar, I set them on top instead of the bottom. 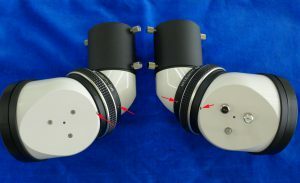 The focuser was replaced from the original one to the Feather Touch True-3-inch type. But I think the normal 3-inch type was enough for this purpose. The end adapter was unnecessary. FTF(Feather Touch Focuser) has established the status of high quality focuser, and many of the high graded OTAs take it. I also think the focuser is good but only in the rotation clamp, it is not good. The clamp is not efficient even when I fastened the three knobs so tight. 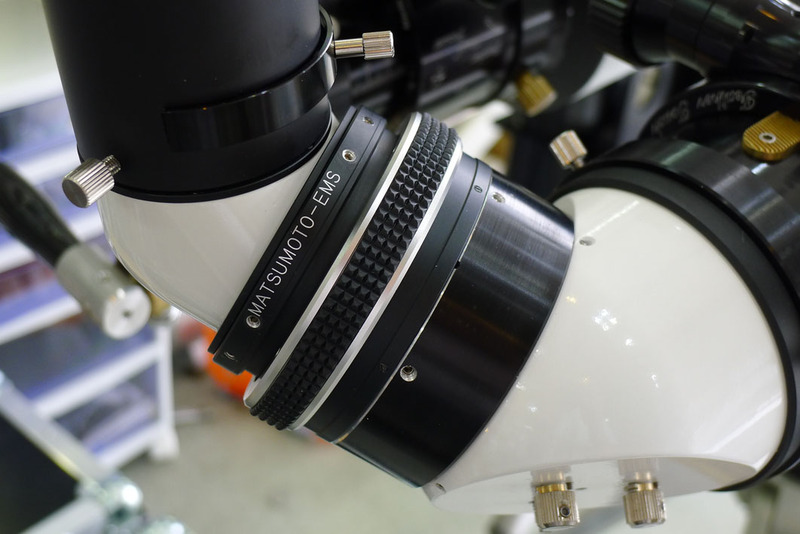 Many of the OTA makers seem to be interested in my EMS, but very few seem to seriously study the EMS and think the suitable spec of the OTA as the material of the binoscope. Back-focus is one of the example. Providing the shorter tubed OTA specially for binoscope planner is not enough,I think. I recommend them to produce the shorter tube as the default and provide the extension tubes for the single use. I don’t remember how many times I have uploaded the information of the EMS, but very few seem to understand my intentions on the specs. The helicoid is connected at each end to the first and second EMS unit by three set-screws. 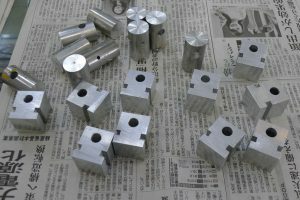 When the set screws are fastened too tight the helicoid will become very heavy to turn, while the set screws too loose, the housings will tend to slip to turn. Do not doubt the original setting when you opened the package of the EMS. It proved to be quite successful in all aspect. 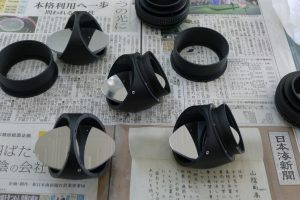 To hide the difference of the focal length of the objective lenses, I will add an inner spacer ring behind the right lens. And the lower half of the objective units will also be carbon sheeted. The weight of the TTS-160 MOUNT is set to the plate by a left screw. Disassemble of the weight was far more tough than I had expected because the gear shaped knob was glued to the center screw. Making another thread hole away from the center of the stainless weight was also a tough work. As I hate to use the glue on the screw, I added the set screw on the knob. Another lot of the joint parts for the handle unit is in the making. I can ship it in a couple of days. Thank you for being patient. Anodizing of the main parts is completed. 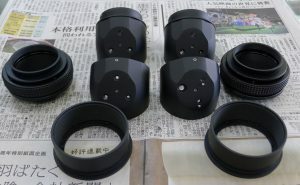 After setting the objective unit, I will check the focus point and decide the length of the eye-side flanges. It may look open frame structure, but it isn’t. The finished appearance will be almost same as the traditional binoscope.